Follow the footsteps of the Hollywood movie stars while walking on the Awards Walk! 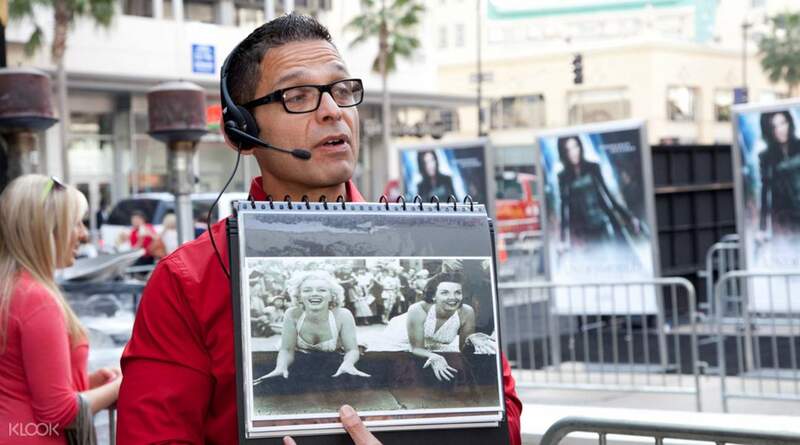 Take up Hollywood's offer of glitz and glam on the Total Hollywood Experience™ Tour! This is Hollywood's only true in-depth experience, which includes the famous LA City Tours' Movie Stars Homes Tour and Behind-the-Scenes Tour. It is the most highly rated of its kind in Hollywood. It covers decades of Hollywood history and popular culture, with visits to the Hollywood Walk of Fame, Hollywood Sign, TCL Chinese Theatre, and more. Then you get to explore movie locations typically closed to the public, especially those that starred A-list celebrities likedew Barrymore, Cameron Diaz, Jlia Roberts, Charlize Theron, and Keanu Reeves. Find your favorite celeb's star as you walk the Walk of Fame, and plant your feet onto their footprints at the TCL Chinese Theatre. Learn the history of Grauman's Egyptian Theatre, and discover why movies came to this neighborhood in the first place. Along the way, you'll discover the lesser known landmarks, theaters, and architectural marvels of the city. This tour is perfect for family or friends who want a Hollywood tour that's out of the ordinary! Gain a deeper understanding of the movie industry and its relation to the world-famous Hollywood! Gaze at the celebrities' handprints, footprints, and autographs immortalized in cement at the TCL Chinese Theatre! If hotel information has not been submitted at time of booking, please call our local operator's toll free number (888)800-7878 or (323)960-0300 24 hours in advance to arrange hotel pick-up and reserve a seat/pickup time. Not the total hollywood tour experience that was advertised. The driver was too fast and seemed to just wanted to go through the tour. Not the total hollywood tour experience that was advertised. The driver was too fast and seemed to just wanted to go through the tour.